TURNER Maurice Edward. Driver 199235, 5th Reserve Bty, Royal Field Artillery who died at Brighton Military Hospital 20 February 1917 age 18 son of Reuben and Caroline and brother of Frederick who also fell and who is mentioned on his memorial. Buried in St Mary Magdalene Churchyard, Adlestrop. 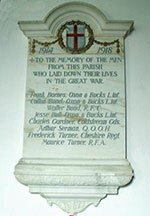 This memorial have him being in the Royal Flying Corps.